Meanwhile it's 2ºC during the day in south. And there's absolutely no wind. For the first time i seen on the news the carbinarios were stopping and testing cars on the side of the road. Perhaps they have been doing this for a while., just never heard of it before. admin wrote: For the first time i seen on the news the carbinarios were stopping and testing cars on the side of the road. Perhaps they have been doing this for a while., just never heard of it before. Very common sight, especially in winter. They are with someone from the Ministry of Transport and also stop buses. 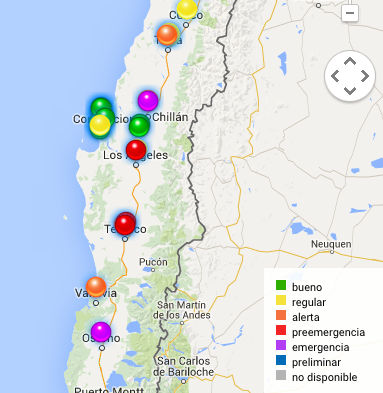 Well if the rain /snow does not start showing in santiago area soon, the lack of water might solve the pultion problem. The south seems way dry for this time of year. Far from December but it is said that El Niño is causing all kind of weather phenomena all over hemisphere. Super draught, monsoon rain falls, volcanoes eruptings and other anomalies. amanaplan wrote: These things are easy to solve, if there is the will. Start doing 'mystery shopper' checks at revision tecnica centres, and hitting them with a massive fine,or loss of licence, if they take bribes to pass gas emissions checks. If they impounded cars for two weeks when they were caught flouting the pre-emergencia restrictions a lot more people would think twice. A 60 luca fine with low risk of getting caught isn't much of a dis-incentive. They did this on mega noticias two weeks ago. Took a car with faulty brakes, no lights working and a snapped rear axel and bribed the revision tecnica guy. Then when the bribed man was cross examined by ministerio staff he claimed he did nothing wrong and it was normal in this work because he can't check everything himself. It wasn't even busy the revision tecnica, what a joke. As for smog not being bad in better parts of Santiago, I think that's not been true today, you can see it if you drive up to the ski slopes or drive in on autopista from north, the smog covers all the land trapped between the mountains. I'm sure glad I moved out the city to the countryside. Although this evening the smog has got worse and even been rolling out past chicureo and only just clearing a bit now in sunset. I seen on the news they are suppose to allow next year alt-energy vehicles (hybrids, electrics, natural gas) to circulate on days there are smog restrictions for other vehicles. super cool, you get to use your car. What baffles me is the total lack of incentive provided for buying such cars. hybrids are running 25 to 30 million+ now. You would think if they eliminated the IVA, and the new tax on new vehicles, hybrid cars would be as cheap or cheaper than the regular cars (or at least scratch the 20 million floor). But, the left and the right will never, ever, ever touch the golden IVA cow, for any reason. If they started touching IVA would you live to regret saying this, as I bet there is a thousand ways Bachelet could muck it up. Something worth mentioning is the number plate car ban on certain days only applies to cars with no green seal, e.g. No catalytic converter. A less it is an emergency such as last Monday. I am surprised that so many cars exist with no catalytic converters this day of age. I think the ban should be all cars including those with catalytic converters. Also I am surprised the carabineros did emission checks as the seal is by manufacturers standards, not the car being tested. Se puede cambiar a Sello Verde un vehículo que cuenta con Sello Rojo o Amarillo? Other huge problem is the santiago micro system does not seem to have emission checks or limits, the buses they use chuck out black smoke and often way over powered for the route they are running. They don't all need the ability to easily do 90kph on the autopista when they only do a small residency route at 50kph. If they just had northern european bus wheels instead of HGV sized ones they'd probably save a fair bit on fuel. There's a lot of bus routes with out pot holes in the better parts of Santiago. End of rant. Back to levelling my garden. I think the whole idea of prohibiting catalytic cars in RM is worthless. I have not seen any study that shows that the polution caused by modern cars have any serious effect on the problems in Santiago. Instead, I think the government should introduce a "cash for clonkers" program to get old cars, buses and trucks off the road. More importantly, something should be done about burning leña - from what I have read, 70% of the small particules causing problems in Santiago comes from the 5-6% of homes that burn leña in winter. (the majority of those are actually in Las Condes!) Actually fining the people burning wood and perhaps prohibiting the sale of leña during the winter months should be enforced. Doesn't half or more of Santigo's air problem come from the local copper mines? Si bien el fenómeno de la contaminación atmosférica en Santiago data de la época colonial, ha sido en los últimos cincuenta años que la relación entre ciudad y polución ha derivado en un asunto endémico e inherente a ella.